JoMi toys - under maintenance : 3050 Pirate Ship - UPDATED! One of the greatest of all Playmobil classics, the 3050 Pirate Ship. 2nd edition (rotating hands figures). 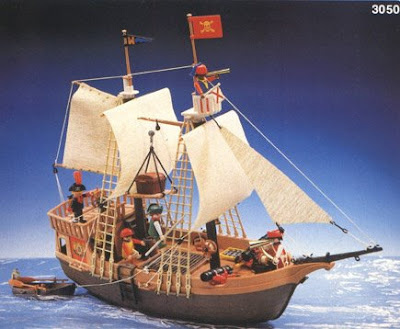 This ship has seen some changes throughout the years, having colored sails and new pirate crews, but if you ask me, none beats this set. 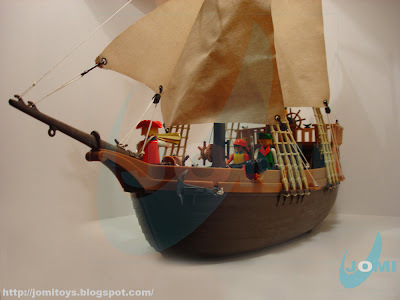 This is THE pirate ship. With a load of accessories (ropes not pictured), you had to take a pretty good care of this baby not to loose any of them. 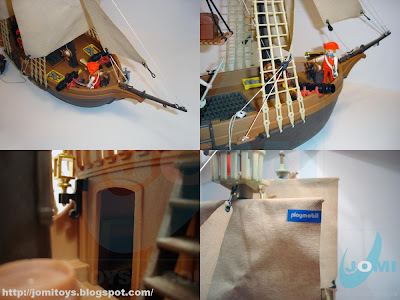 Also, the ship´s masts had softer plastic details attached with very little tolerance to time. The original crew and deck and hull shots. The white piece inside is a counter-weight. It was fun to play and imagine scenes with this set. One of the most complete and functional toys ever. I´m not a definite fan of the genre, but credit must be given when credit is due... spectacular piece! Fire at will! Dead men tell no tales! This was kind of a holy grail when I was a kid. 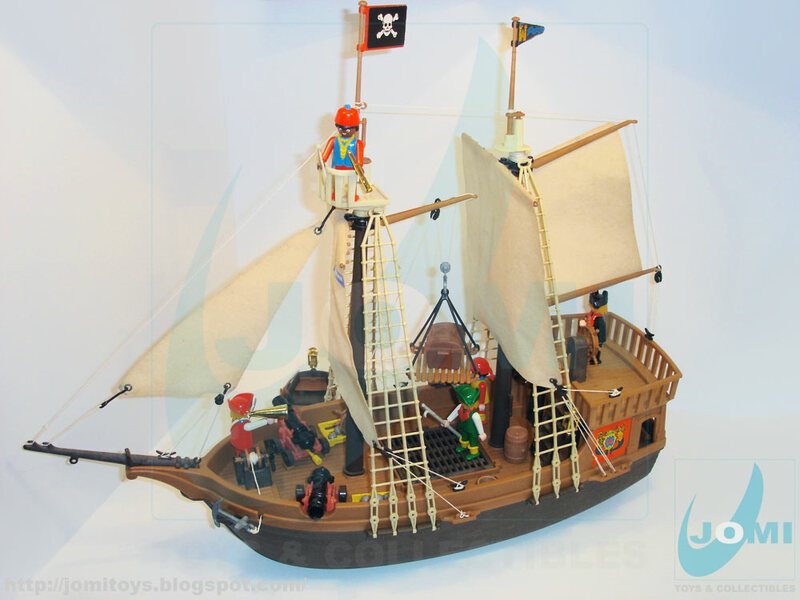 I actually dreamed of the day my parents would buy me this (and I finally did get it when I turned 5). Last week i visited this site and rememberd a old box in my garage. 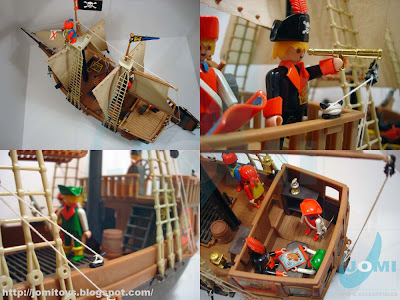 And yes indeed, there it whas: My own Playmobile pirateship. Got it for my birthday when i whas 5 and I am now 38. It is still in a very good condition and 95% compleet. Thanks for helping me remind that box and the great treasure inside. - How are the 1st ed and 2nd edition different? - What years did the 1st and 2nd edition come out? 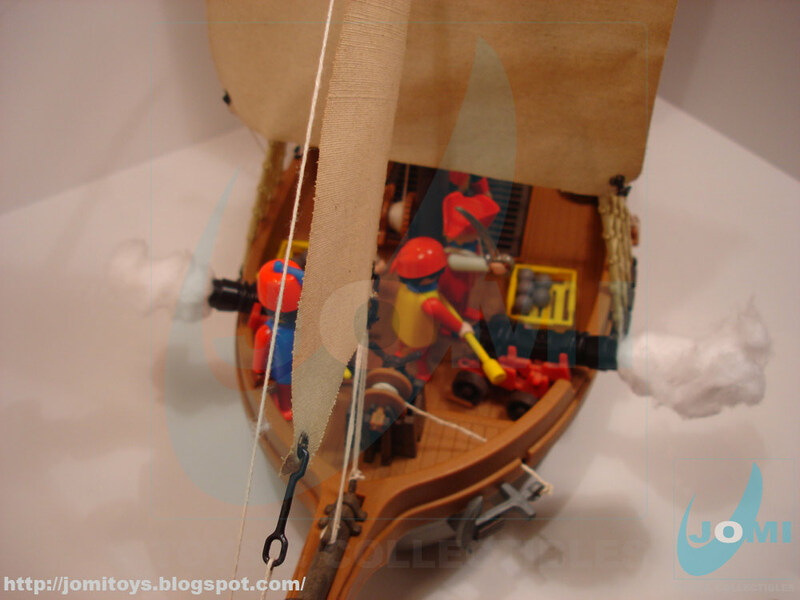 - I have the pirates for the ship (2 sets) one with rotating hands and one set without. how are these different? years made? 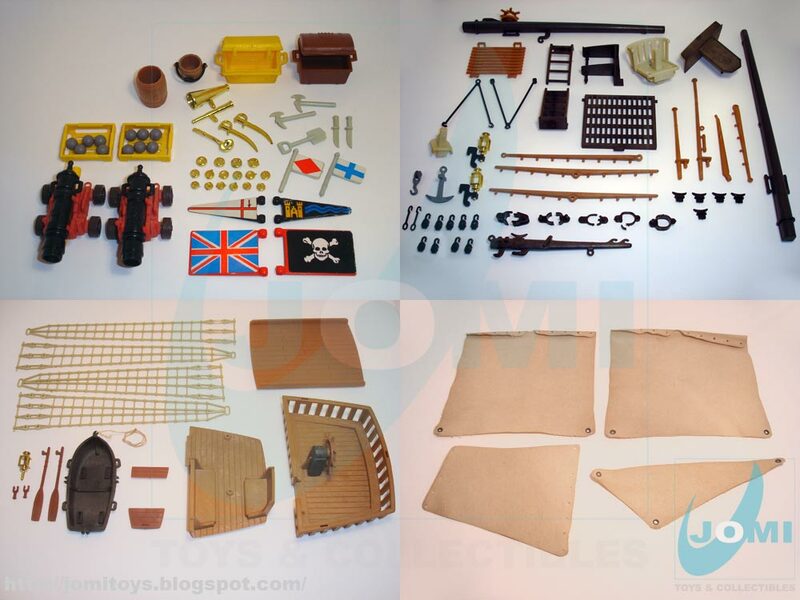 - And finally, how are the 3050 and 3550 different? perhaps the 3550 is a later edition that came out when i got one in 1980-81? 1st and 2nd editions are related to revolving hands. 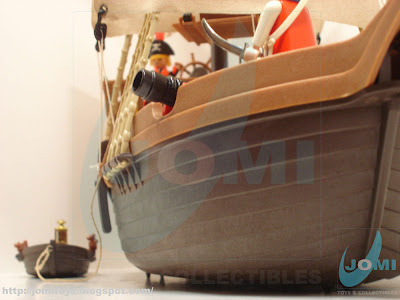 2nd even has 2 different versions (one with the pirate with the hook hand or without - Western Europe). 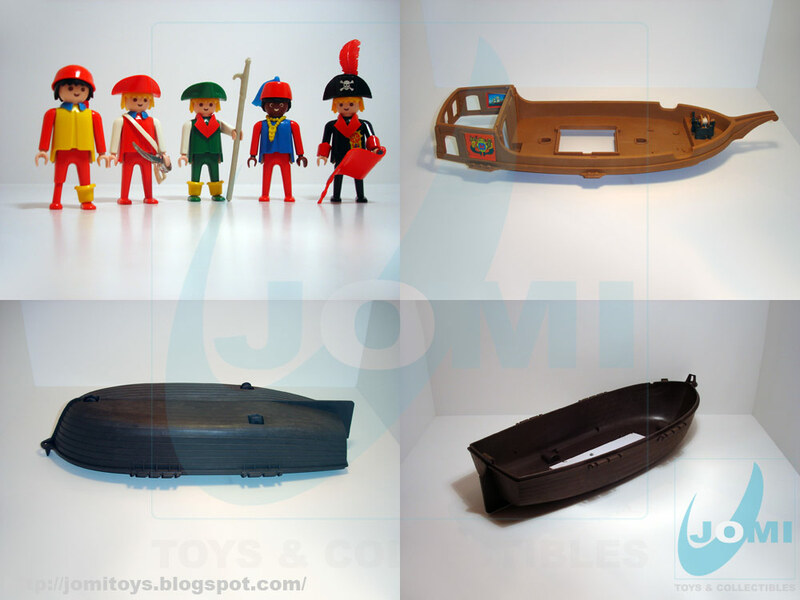 3050 and 3550 are simply catalog related issues where as you probably know playmobil marks their worlds/themes. They even reuse their numbers when sets are discontinued and that makes an enormous confusion. Especially if you´re searching for a particular item like Elephants that suddenly turn into kids on bikes, pe. The version you got could have been any of the 2, actually. That only depends on knowing what geobra plans were in the US then. I´d guess 3550. But these are guesses. Thanks for your question, very interesting. I´ll get back to you on this when I get some definite points for you. I own a 3050 pirate ship, identical to the one of the last picture. Some parts are missing, and now I'm desperately seeking for a front mast, the two upper masts, and the second white watchtower. I've been looking on ebay too, with no success. I guess I have to be more patient. Anyhow, if you have any information on where I can get these parts, it would be greatly appreciated. Dug mine out this week. My son loving it. Sails have gone, but gonna use some old blinds as a substitute.